The Philippines is one of the pioneering countries in South East Asia to embark upon universal health care, with the ultimate goal of ensuring equal access to healthcare services for everyone regardless of their socioeconomic status and financial situation. Since the establishment of PhilHealth—the country’s social health insurance system—the national government has continuously invested in the program to expand its coverage and benefit packages and grow existing funding sources. The present study sought to examine the effects that recent developments in the Philippines’ social health insurance (SHI) may have had on Filipino indigent members’ healthcare use and out-of-pocket expenditures. To address this objective, a combination of quantitative and qualitative approaches was undertaken as the research methodology. 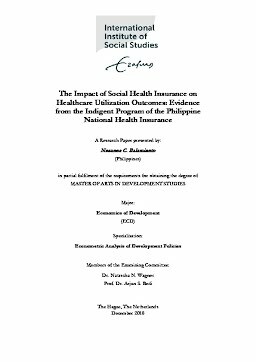 First, I analyzed the impact of PhilHealth indigent membership status on outpatient and inpatient care utilization as well as out-of-pocket payments using three rounds of a nationallyrepresentative survey on demographics and health in the Philippines, while putting in place measures to reduce potential biases. Results show that participation in SHI among Filipino indigents is robustly and positively correlated with outpatient and inpatient care utilization, and negatively associated with the amount of personal income, loan, or savings used to finance hospital confinement. However, evidence linking PhilHealth membership with the reduction in total amount paid for outpatient and inpatient care cannot be established. Second, I conducted key-informant interviews among selected indigent members in the Philippines to understand healthcare utilization choices and perceptions of quality of care. A number of critical elements to improving healthcare utilization among the poor emerged from the qualitative data. One is to enhance PhilHealth members’ awareness of their health benefits. Two is to improve the supply-side provision and delivery of services, especially among public health facilities, as this may affect the perception of quality of care and, subsequently, utilization of healthcare services. Finally, on the supply side, the sustainability of providing free health insurance membership is a crucial concern that requires a clear direction, and the mechanisms to ensure that the true poor are targeted need to be put in place. Thesis Advisor Wagner, Natascha N.